As you may have seen, I have been campaigning to improve the sexual harassment reporting system on campus. For me to make real change at Middlesex, I NEED YOU, MDX students to help me understand what you need to improve the current reporting system. I strongly believe that my #WeBelieveYou campaign will empower survivors of sexual harassment and violence, on and off campus, with the reporting system being a huge part in how we can achieve this. To make reporting accessible to all students, I am organizing focus groups, specifically for those who would like to take part in shaping how the new system on campus should look like. The information you share in the focus group will be invaluable to the data we share with the university! The data will be included in a paper to be presented and discussed with the relevant university bodies. All feedback will be made confidential and anonymous. Complete the survey below. We understand that for some participants talking about sexual harassment may be triggering and MDXSU strives to support all participants in the focus group when discussing sensitive topics. Advisers will be on-hand throughout and we can arrange for you to meet with the advisors privately before or after the focus group. If you feel you may benefit from additional support, please let us know. 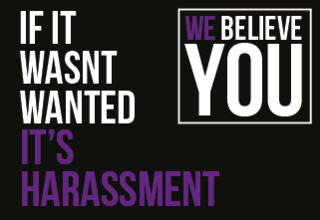 As part of contributing to the campaign, all participants will receive a #WeBelieveYou campaign t-shirt, a £5 amazon voucher and pizza on the day. This is our way of saying thank you for helping to improve the experience of student survivors of sexual harassment and violence on campus. Thank you everyone who has been involved so far and I look forward to being able make real change on this issue across campus.